Have questions about being a TimeBank member? $40 for a two adult household. Under 18 year old children are included in both individual or household membership. Please have both members apply as individuals. You will both receive emails giving further instructions on payment for your membership. Only one of you needs to pay for the household membership. The Forward Fund allows applicants who find it difficult to afford membership dues a way to join the TimeBank with either partly or fully waived dues. We have a limited number of fully waived dues memberships available and we have a waiting list at this time. Partly waived dues memberships are currently available at $12 for an individual membership and $25 for a household. 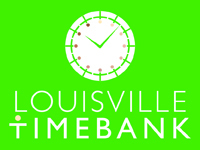 Please email Donna and Karen co-Directors of the Louisville TimeBank at louisvilletimebank@gmail.com to inquire further about availability of fully waived dues memberships and to be placed on a waiting list. 600 MEMBERS. 27,321 HOURS EXCHANGED.